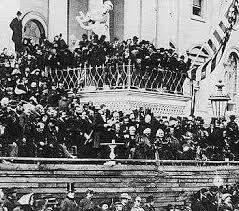 On March 4, 1865, Abraham Lincoln was sworn in to his second term as the president of the United States, giving a speech which many consider his best, even better than the Gettysburg Address. He was elected for a second term in the election of November, 1864, an election which many argued should not take place under the press of war. Republicans were understandably concerned about conceding power to the Democrats who settled on former commander of the Army of the Potomac, Major General George B. McClellan, as their candidate. 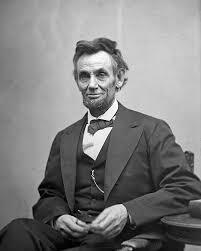 However Lincoln believed that such an event, so fundamental to democracy, could not be deferred, even in wartime. The speech was a mere 703 words and took about seven minutes, the second shortest inaugural speech in US History. It was decidedly impersonal. After the opening paragraph, he did not use the word “I”; neither did he refer to any of his previous statements or actions. Rather he sought to understand the great conflict and to look with hope and compassion toward the future. Turning to slavery, Lincoln said: “All knew that this interest was, somehow, the cause of the war.” He continued by indicating the faulty assumptions both sides made about the magnitude and duration of the war. After concluding, he turned to Chief Justice Chase and took the oath of office, ending with an emphatic: “So help me God!” He then kissed the Bible to the sound of an artillery salute and a cheering crowd. A retired Army officer, Fred Zilian teaches history, ethics, and political science at Portsmouth Abbey School and Salve Regina University and is a member of the Rhode Island Civil War Sesquicentennial Commemoration Commission Advisory Council. He is writing an occasional series of columns highlighting various aspects of the Civil War and their impact on Newport County and Rhode Island for The Daily News. Attend the Tribute to the Civil War and Abraham Lincoln on April 17 at the Jane Pickens Theater. Tickets at www.janepickens.com. This entry was posted in Uncategorized and tagged Abraham Lincoln, American Civil War, Civil War, Fred Zilian, Frederick Douglass, John Wilkes Booth, Lincoln's Second Inaugural, Second Inaugural Address. Bookmark the permalink.